La Renée was on the Today Show this morning for less than two minutes. She managed to say more in those brief moments than the hosts say in more than two hours. So, she plugged Homage: The Age of the Diva (get this recording - it is STUNNING! 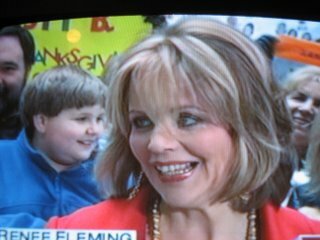 ), her gig at the Macy's Thanksgiving Day Parade tomorrow and discussed her her pie-making plans. AL - We have extra reason to give thanks this morning. Opera super star Renee Fleming is not only appearing in the Macy's Thanksgiving Day Parade tomorrow but she's also released a new album called Homage: The age of the Diva (cut to a picture of the album). Renee Fleming, Good morning and Happy Thanksgiving. RF - Hi, why thank you. RF - Well it's a tribute to singers from a bout a 1q00 years ago, the great divas of the past. It's the richest most beautiful music. I always say I want to take a bath in this music. It's like chocolate. It's gorgeous. RF - I am. It's the Air Force Band and Chorus. Yes. And we get some jets too! AL - Oh yeah that's right, there's going to a flyover. RF - Yeah but I don't want them to drown out my high C though. They can't do that. AL - That's going to be a little difficult with the rain. I don't know how that's going to affect that. Now after the parade are you cooking Thanksgiving dinner? RF - I am baking 11 pies today. AL - 11 pies today! What kind! RF - Yes, yes, it's a little ambitious. Oh gosh, we've got everything from apple and pumpkin to chocolate pecan and a couple of fancy ones too. We're all bakers, the girls and I.
AL - Wow, you're gonna bring some to the parade? AL - ...good luck with the new album. We'll see you tomorrow. i thinks that interview was adorable. i wonder if she's a good baker? thanks for the transcript, Sarah!